Are Humans are Biologically Bad at Poker? People usually say that you are your own worst enemy, and sometimes you are, but in the case of Poker, this is apparently an unequivocal truth. According to Nick Wealthall, one of the most famous UK poker experts, your brain has been biologically wired in order to make you fail, especially when the moments to break it or make it present themselves. How is this possible? Aren’t we supposed to be the most adaptable of all living beings? Why does our brain refuse to follow poker strategies effortlessly? Wealthall’s hypothesis is that the majority of human beings are commonly bad poker because, as a species, we have learned to do the opposite of what poker asks of us in order to survive. Poker requires you to make decisions under a lot of pressure and a time constrain; it advices you to risk big to win big; and it forces you to have patience to deal with periods of little to no compensation. All of these characteristics are exactly what our evolutionary process has taught humans beings not to do in any situation if they want to come out on top a.k.a alive. For example, some players find it hard to bet big and risk all their chips on a play in higher rounds of betting because they do not want to part with their accumulated wealth, evolution has taught us to preserve food or “goods”. What is he based on? 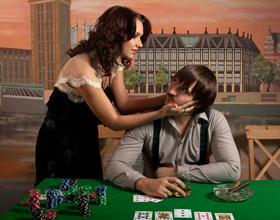 Poker is unpredictable, ruthless, and cruel. It teaches you that sometimes, even if you do everything right; a flop or even a river can come along and destroy your chances of winning the pot. Obviously, when this happens, you experience anger and frustration. Here is where our first neurobiological impediment attacks, “bad luck bias” as Wealthall calls it. This neurological enemy will negatively affect the ways you play your hands for the rest of the day, usually giving you poor results. exasperated that you have a desire to abandon it or end it by making irrational decisions. Why? Because your brain is telling you that that result was not supposed to be, ergo, the game is not fair and you need to abandon it. Wealthall uses the example of a hunt. If the animal keeps escaping no matter how many traps are set, the hunter will simply abandon the pursuit and go find other means of nourishment, hence, out extreme capability for adaptability. Plus, human beings are conditioned to expect outcomes based on the idea of righteousness and privilege. Our biological programming or instinct tells us that if we worked hard for something, we are entitled to it, a concept that does not really apply to the ups and downs of the poker table. So when we lose a pot that we were supposed to win, our brain short-circuits and lets the emotions overflow it. In order to overcome this self-handicapping, Wealthall recommends you to stop blaming your “back luck” and refocusing your thoughts to match the one of a top player. They never waste energy obsessing about results that they could not control. They focus on what they can. Therefore, top players are usually not distressed by losses; they have learned to detach from the frustration that losing entails. When they lose, they think about the play, what they could have done to played it better, and they learn from it. Next time you are playing one of our exciting poker tables at Palace of Chance, try out these tips and let us know how much you have improved!